Summary: A detailed 3D structure of nicotinic acetylcholine receptors could help pave the way to developing new treatments for nicotine addiction, researchers report. UT Southwestern researchers today published in Nature atomic-scale blueprints of the most abundant class of brain nicotinic acetylcholine receptors. A structural understanding of the protein, found in neurons, could lead to new ways to treat nicotine addiction from smoking and vaping. Researchers obtained the high-resolution structures using the University’s $22.5 million cryo-electron microscopy (cryo-EM) facility, where samples are rapidly frozen to prevent the formation of damaging ice crystals and then viewed at minus 321 degrees Fahrenheit (cryogenic temperatures). UT Southwestern’s facility – which runs round-the-clock – is one of the world’s top facilities for cryo-EM structural biology. Two novel aspects of the study make it stand out in the fields of structural biology and neuroscience. First, the researchers uncovered new biology about how the receptor binds nicotine in the brain, Dr. Hibbs said. Second are the findings related to technical aspects of how the protein assembles. The protein they studied is made up of five subunits, of two types – α and β. These α and β subunits assemble in two different ratios into two distinct five-subunit complexes, a 3α:2β form and a 2α:3β form. Complexes of both ratios are found in the brain. “We used an antibody labeling approach to identify subunits and overcome challenges in cryo-EM computation to obtain structures of both five-subunit complexes from a single sample. This had not been done before and provides a general approach for determining the structures of many other types of multisubunit channels and receptors that have multiple ways to assemble,” explained Dr. Hibbs, an Effie Marie Cain Scholar in Medical Research. “The two structures are composed of different ratios of α and β subunits. By using an antibody that binds only to the β subunits, we were able to tease out the two structures from one sample – one receptor has two antibodies bound, while the other has three bound,” explained lead author Richard Walsh Jr., a graduate student in the Molecular Biophysics program. 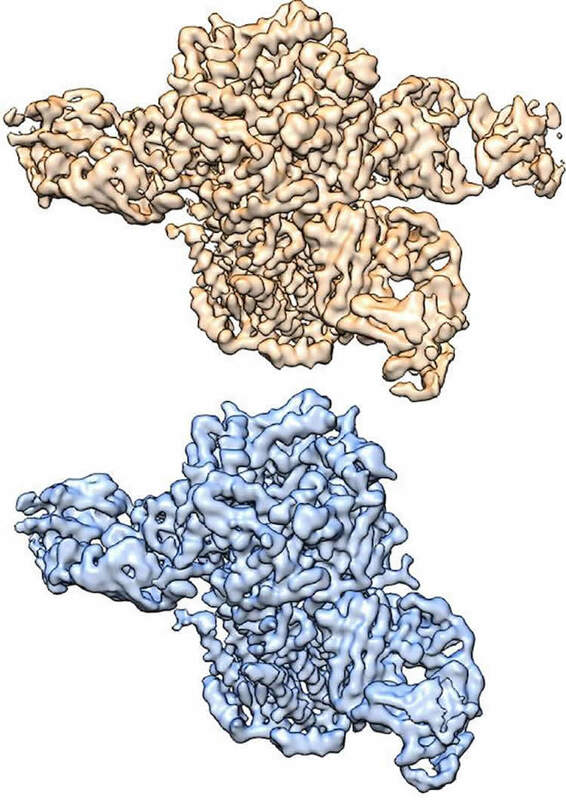 Three-dimensional structures of nicotinic acetylcholine receptor determined by cryo-EM, courtesy of Hibbs Lab. NeuroscienceNews.com image is credited to Hibbs Lab, UT Southwestern Medical Center. “Being a lead author on an accepted manuscript is in and of itself an extremely gratifying experience; being the lead author on a study accepted by Nature still feels surreal,” he added. The Hibbs laboratory was previously able to obtain a structure of one of the two complexes using X-ray crystallography, a first at that time due to the difficulty of crystallizing membrane proteins. “For membrane proteins in particular, obtaining crystals that will diffract to high resolution is challenging, which makes cryo-EM particularly powerful. We were previously able to obtain one of these nicotinic receptor subunit arrangements by X-ray crystallography. Cryo-EM gave us both arrangements, from a single sample, at higher resolution,” Dr. Hibbs said. UT Southwestern co-authors include: Anant Gharpure and Claudio Morales-Perez, both graduate students in Molecular Biophysics, and Dr. Jinfeng Teng, a research scientist in the Hibbs lab. The study’s co-lead author is Dr. Soung-Hun Roh of Stanford University. Funding: The study received support from the National Institutes of Health, the Sara and Frank McKnight Fund for Biochemical Research (Richard Walsh); and The Welch Foundation. The cryo-EM facility received support from the Howard Hughes Medical Institute, the UT System’s Science and Technology Acquisition and Retention Program, and the Cancer Prevention and Research Institute of Texas (CPRIT). Image Source: NeuroscienceNews.com image is credited to Hibbs Lab, UT Southwestern Medical Center. Original Research: Abstract for “Structural principles of distinct assemblies of the human α4β2 nicotinic receptor” by Richard M. Walsh Jr, Soung-Hun Roh, Anant Gharpure, Claudio L. Morales-Perez, Jinfeng Teng & Ryan E. Hibbs in Nature. Published May 2 2018. UT Southwestern Medical Center “Cryo-EM Structure of the Nicotine Receptor May Lead to New Therapies for Addiction.” NeuroscienceNews. NeuroscienceNews, 2 May 2018. UT Southwestern Medical Center “Cryo-EM Structure of the Nicotine Receptor May Lead to New Therapies for Addiction.” http://neurosciencenews.com/cryo-em-nicotine-addiction-8949/ (accessed May 2, 2018). Fast chemical communication in the nervous system is mediated by neurotransmitter-gated ion channels. The prototypical member of this class of cell surface receptors is the cation-selective nicotinic acetylcholine receptor. As with most ligand-gated ion channels, nicotinic receptors assemble as oligomers of subunits, usually as hetero-oligomers and often with variable stoichiometries1. This intrinsic heterogeneity in protein composition provides fine tunability in channel properties, which is essential to brain function, but frustrates structural and biophysical characterization. The α4β2 subtype of the nicotinic acetylcholine receptor is the most abundant isoform in the human brain and is the principal target in nicotine addiction. This pentameric ligand-gated ion channel assembles in two stoichiometries of α- and β-subunits (2α:3β and 3α:2β). Both assemblies are functional and have distinct biophysical properties, and an imbalance in the ratio of assemblies is linked to both nicotine addiction2,3 and congenital epilepsy4,5. Here we leverage cryo-electron microscopy to obtain structures of both receptor assemblies from a single sample. Antibody fragments specific to β2 were used to ‘break’ symmetry during particle alignment and to obtain high-resolution reconstructions of receptors of both stoichiometries in complex with nicotine. The results reveal principles of subunit assembly and the structural basis of the distinctive biophysical and pharmacological properties of the two different stoichiometries of this receptor.